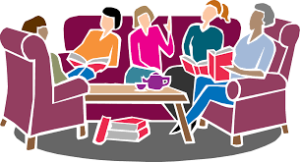 For several years we were known as the Reading & Discussion Group, but we are a very good General Book Group, (as distinct from Classic Books). That’s not to say we avoid discussion after reviewing the book…………….. The group meets every 3rd Wednesday of the month from 2.30 – 4.00pm at each other’s houses. The books to be read, usually paperbacks, are suggested by a member who introduces it an as mentioned. General discussion follows looking at plot, period, characterisation and ideas advanced. Typical choices have been mostly novels but occasionally non-fiction and have included: I. C. Sansom ‘Dissolution’; Iris Murdoch ‘The Bell’; Eric Newby ‘Love and War in the Appenines’.